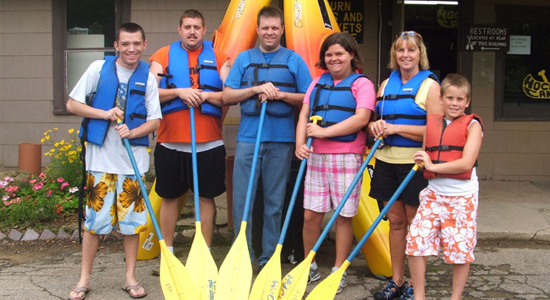 This morning Sarah and I headed to Logan with Mom, Jeff, Crissy, Derek, Jake, Tyler and Jenny for a canoe trip down the Hocking River. Tyler, Derek, Me, Sarah, Jenny and Jake. Sarah and I were the first in the canoe, but it was Crissy and Derek that were the first into the water. And within the first ten minutes of the trip Mom and Jeff were in the water as well. It was a mostly cloudy day with temperatures that rose into the eights. Half way through our journey we stopped for some snacks and drinks on the bank of the river. The folks at the Hocking River Canoe Livery told us that the river was about two feet above normal. The current helped us along the way. We hit a few trees and a rock or two, but Sarah and I never tipped our canoe. The beautiful trees, sky and river made for a great outing. The married (and wet) people seemed to complain the most. But I'm sure we all had fun. Check out the pictures from the trip.